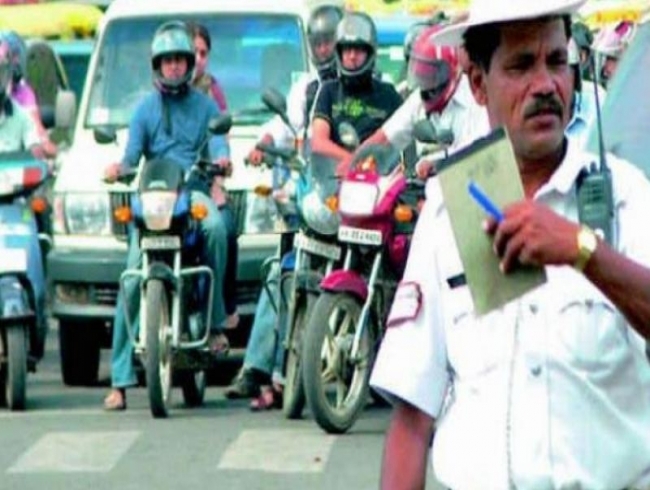 Hyderabad: An alert citizen who took the picture of a helmetless constable who was riding on a two-wheeler without a number plate and posted it on social media is satisfied with the police response. Constable Vasath Kumar was suspended by Hyderabad police commissioner Anjani Kumar on Saturday. Mr Shoaib Hashmi, a social worker, said the picture was taken at Murad Mahal Colony at Talabkatta. “We often see common people are penalised for improper vehicle number or riding without licence but policemen themselves break the law in broad daylight,” Mr Hashmi said. He said he had posted several pictures in the past regarding traffic rule violations. “I will continue to do the same in future,” he said and asked the police to taken action when they notice such infarctions of the law. Some politicians who were responsible for the enforcement of law were reluctant to follow traffic rule which could be seen every day. “Action should be initiated on them also. Such enforcement of the law should be regular,” Mr Kanumala said.